Much is being written and spoken of today with regards to the preface to a series of books which includes the comment in the post below by Joseph Ratzinger. I am of the view this is not his writing because of style. None of us really know. What I have determined is that too many of us have let Ratzinger off the hook. We loved him. We had illusions of who he was and of course, his Reform of the Reform and then Summorum Pontificum endeared us to him. He seemed to sincerely attempt to rid the Church of the "filth" and perversion, more so than any pope before him or clearly the current occupant of the papal office. Clearly, we have seen him as a father. But the reality that we must all face is that he is a coward. A pathetic failure. A man who threw down his cross and abandoned his children to wolves, to evil men. The three links below are from people with much more time and inclination to research and report than this writer, particularly the extensive essay by Hilary White at The Remnant. I don't profess to know the full truth but what I do know is this, it is not found to be in workings of Jorge Bergoglio. "Nonetheless, I do not feel that I can write a brief and dense theological page about them because for my whole life it has always been clear that I would write and express myself only on books that I had also truly read. Unfortunately, even if only for physical reasons, I am not able to read the eleven little volumes in the near future, all the more so in that I am under other obligations to which I have already agreed. I am sure that you will understand, and I extend to you my cordial greeting." Pope Benedict seems to say that after all he is not too much interested in Francis' "theology and philosophy" books! As someone who found themselves in a similar predicament as it regards Fr. Ratzinger at a young age, I know all too well the abandonment we're all feeling. But I also know the joy of coming under the care of a much better person than the person who left you. Hopefully that happens to us within our lifetime(s). It certainly seems that Benedict has run and has run very fast for fear of the wolves. Even though he, like John Paul II, sold his soul to the conciliar genie, I always believed that he had maintained some sense of doctrinal integrity. (not so, of course, for Bergoglio and the Filth) Maybe I was wrong all along. It sure looks like Benedict has simply thrown in the towel. This is very disappointing and it hurts. Can't you now hear all the "I told you so" comments from the sedevacantist crowd. The heart of the matter is, Ratzinger, Burke, and the other well-meaning prelates, are all still modernists. There is no reforming the reform. The reform was a disaster and needs to be circular filed, lock, stock and barrel. Until a prelate steps forth with a complete and utter condemnation of Vat 2 and all its works and all its pomp’s and, may I add, all its “saints”, we will find ourselves tomorrow in the same never-never-land we find ourselves today. When I was a young Catholic, I’m ashamed to say that I paid little attention to the Pope and assumed that all was going along Catholic and that I had really weird Priests. Then, one day on EWTN, I saw Pope Benedict XVI giving an audience in front of the most horrifying sacrilegious monstrosity and I realized, woe something is really wrong here. It was Paul VI Hall and I’d never seen it before. That was just a few yrs before Bergoglio. Seems to me Novus Ordo Watch was right all along. Who knew? There are Ratzinger experts who can surely speak to the tone of his letter and what he has written. I have thought on a few occasions what is attributed to him can't be him. I never noticed him inserting himself into missives nor being snarky. But, he's older now and things change, even personalities can change. I don't know. But, if he was held against his will and forced to sign things, he has ample opportunity to say so and get to safety. I saw a video in which he profusely thanks Frankie for his protection or whatever, good grief. I think their is ample evidence that what we thought we had we never actually had. They are all in the same club and perhaps we just couldn't see it. This explains the maddening question of why things have only deteriorated each year, decade, no matter who was in. It's looking more and more like the logical conclusion, after much giving of the benefit of the doubt. I'm sorry for Catholics who are truly sad about it. I really am. 5 years ago today Francis is elected pope....that date being 3/13/13....anything sinister or occult about that? Nah...nothing to see here move along. Laderia, head honcho of the new CDF comes out the other day with the public statement that Francis and his minions consider the church to be a pyramid...a pyramid?! Now what organization thinks in terms of a pyramid? Occult guys think they are very very smart and that the great unwashed cannot possibly understand their inside jokes and scoffing. St Augustine refers to them and how they work in book 4 chapter 32 of the City of God. Yea they are laughing at us and sorry to say it looks like Benedict and Wytola are part of the Vat2 scheme....but rejoice...the truth shall set us free. I don't often disagree with you, Vox, but I think you are completely wrong in judging Benedict a coward and failure. While we cannot know that he was following the will of God in stepping down, we know that God is certainly using this act to reveal all the evil and evildoers in the hierarchy. It's been non-stop since Bergoglio usurped the Chair, hasn't it? John Paul couldn't defeat them. Benedict isn't as strong as JP was. He refused to let them push him out! Even though it is a spiritual battle being waged, exposing the evil is the beginning of conquering it. He helped cover up the 3rd Secret of Fatima. That's all you need to know to suspect him. Lord, we are in sore need of real leadership. Make haste to help us. He abandoned us. His whole life spent reading of wolves in sheep's clothing. Maybe he thought that was a fairy tale. Although I too am hurt by Pope Benedict XVI's resignation, I cannot judge him. He might have thought that he was too weak to fight and he was certain that someone of his calibre would have been elected to complete his work with fresh energy. What I can say is that I had a hard time reading his writings. Unlike Pope John Paul II, Pope Benedict XVI always seemed to start off making the case against the faith and even mocked it before presenting the Catholic proposal which wasn't always backed up. He might have been trying to mirror St Thomas Aquina's style, but St Thomas Aquina always started off with the Catholic proposal before adding counter-arguments and then follow up with Catholic Answers. Someone who had faith would gain faith with St Thomas Aquina's approach, and even someone of weak faith could skip over the counter-arguments to get the full Catholic answer that would eventually strengthen his faith enough to look at the counter-arguments. With Pope Benedict XVI's approach, you start out being discouraged and if you get to the Catholic proposal, you might not even be given enough support to make the case. To me, it seems Pope Benedict XVI gave too much credit to the modernists so he unintentially helped their cause. What's worse, many of his earlier works are dated since modernism is a moving target based more on instrumentalism (i.e. if an argument convinces, confuses, or intimidates people into silence, it's true, if it doesn't, move on to something else that will) than actual logic. As a consequence, I've felt his writings strengthen the case for modernism since they add to what modern modernists now propose, before providing a half-hearted answer. So I'm not surprised that someone like Pope Francis came after Pope Benedict XVI. At first even people like Fr Z. made the case that Pope Francis was in continuity with Pope Benedict XVI because Pope Francis started with the "give modernist credit" and "propose the Catholic Answer" approach. But this approach is fundamentally broken, which is why this Papacy is fundamentally broken. Truth is Truth and the other side must be clearly presented the Truth and be convinced that you are certain that it is the Truth, before they will give with take Truth seriously. They might violently disagree it is true, and you might have to given them friendly room to disagree so they can examine the argument with their head and not their heart, but even if they are persistent in denying the Truth, life is based on Truth, so those arguments will be answered by life itself. Eventually, they will be forced to admit Truth. Not to be funny....but at this point who really cares?? 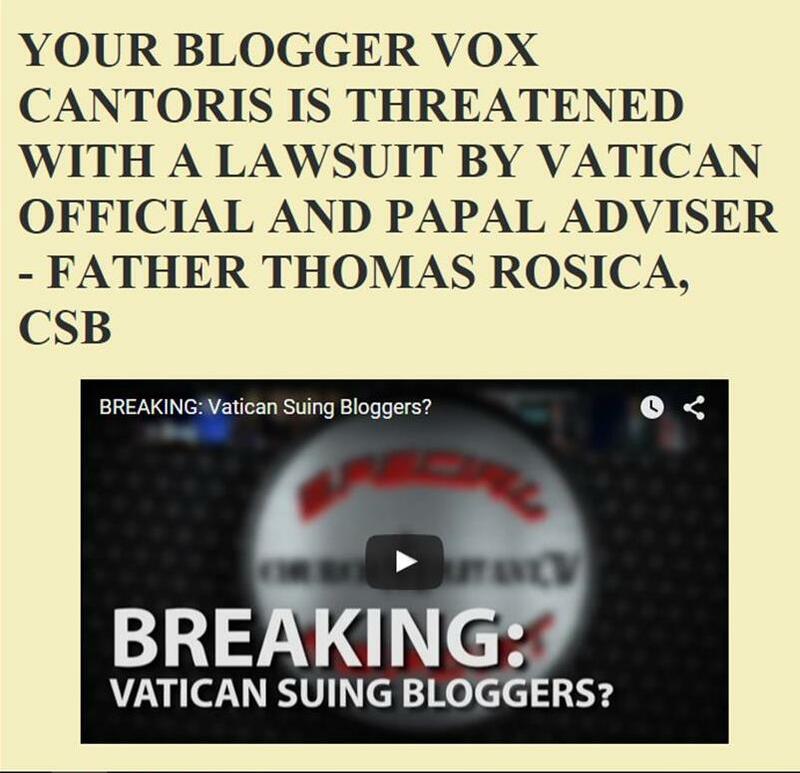 Circus Bergoglio and his coterie of sodomites and sodomite enablers have brought the 1,000 year rule of the "Uber" papacy to a screeching halt. No one and I mean NO ONE with an ounce of intellectual integrity takes the claims of papal authority and infallibility seriously any more. Faithful Catholics have no choice but to admit the truth! Following Louie, it doesn't matter if the letter is real, forced, or fake - the end result is the same. Both men are the same in fundamentals.